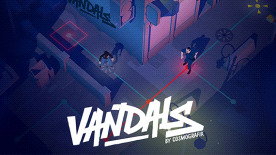 After Type:Rider, Vandals is the new project by Cosmografik. It is a video game published and co-produced by ARTE - the European cultural TV and digital channel - and Ex Nihilo. Rock to the rhythm of an original soundtrack: headphones recommended!